Now that the garden is in it’s time to hit the wild mint for some seasonal greens and more immediate gratification. And no need to fuss, the mint is perfect on its own. 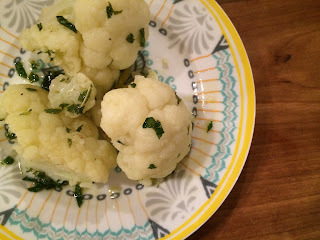 Cut a head of cauliflower into florets then steam for approximately seven minutes or until it’s tender but still crunchy. Drain and immediately toss with a quarter cup of extra virgin olive oil, a large handful of chopped mint, and kosher salt and pepper to taste. It’s a busy time of year, best to keep it simple and tasty.